Whether you are a teacher or a parent, helping preschoolers master listening skills is no small feat. Aside from encouraging preschoolers to focus, teaching them to listen and develop auditory skills can pay great dividends from elementary to middle school and beyond. Try these listening activities for kids who are just starting to master these skills. When you're thinking about activities that promote listening, the first thing to remember is that there is a difference between "listening" and "hearing." Anyone with functioning eardrums will hear things, but that does not mean that they pay attention to them or understand them. Listening, on the other hand, is a skill that takes some effort, interaction, and practice. These activities will help your child learn and practice this important skill. This game requires only a blindfold to play. You can play with one child or groups of two. The goal of the game is to start in one corner of the yard and make it all the way around the perimeter without bumping into anything. Blindfold the child and then give him instructions to keep him from bumping into anything. Directions should be simple, such as "walk forward," "stop" and "two steps right." Unless the child listens carefully, he may bump into something. 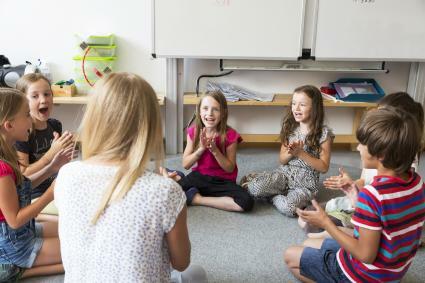 Sit children or family members in a circle and explain that each person will add one sentence to the story around and around until the story is complete. Good starters include phrases like "Once upon a time," "She couldn't believe it, but..." and "Nothing like that had ever happened before." The adult should start the story, and then go around the circle clockwise with each person adding a sentence to the story. Children must listen carefully to know what happened before in the story and be able to add to it in a way that makes sense. For this activity, you'll need a bell and a whistle. Explain to your child that when he hears the bell, he should walk and when he hears the whistle he should stop walking. You could also substitute other activities in place of walking, such as dancing, skipping or doing jumping jacks. The goal is for the child to listen carefully to the two different sounds, so he knows which direction to follow. And it gets them moving. Sing a line from a simple song like "Mary Had a Little Lamb"
Tell your child he must mimic you exactly. This will get him to pay attention to how many claps, stomps, and snaps. For this activity, you'll need a box of colored sidewalk chalk. Your child will need to know his colors and preferably shapes as well. You can adapt the items accordingly. For example, if he only knows colors, then draw all circles in different colors. Find a large, safe concrete play area, such as a patio. If you use your driveway, place orange cones to keep cars from driving up while your child is playing, and pay careful attention to the street. Draw each of the following at least three feet apart: blue circle, purple square, blue triangle, and pink rectangle. Sometimes you want quick listening activities that you can do in the car or at the dinner table. This helps kids to work on their listening skills but adds a bit of fun too. This is a great version of 'Simon says' that you can play with kids anywhere. Call out simple instructions like 'Momma says' pat your head or tap your cheeks. As they get better at the instructions, you can make them more difficult and have them do multiple things at once. Make sure they pay attention to 'Momma or Daddy says'. Another listening game that you can play anywhere is find something. Depending on what your kid knows, you might say find something purple or find something shaped like a triangle, etc. They should look for the object then try to describe it to you to see if you can guess what it is. For example, you might say find something blue and they would describe your blue glasses. You might say find something rectangle and they might describe meatloaf. Not only does this work on their listening skills but builds their vocabulary as well. This game helps kids to work on their alphabet letter sounds. You call out a letter sound and they need to find something with that letter sound around them or think of one in their head. This helps them to work on phonics and listening at the same time. Little kids love games where they can clap and make noise. For this game, you give kids a theme like food or toys. Then, you say words like dolls, matchbox car, blocks, toilet brush, etc. Kids should clap for the word that doesn't fit (i.e. toilet brush). According to Oxford Learning, students with good listening skills tend to do better in school. Learning to listen is a skill that really isn't taught to school-age children, so instilling this important concept in your preschooler can give him a head start before he begins a formal education. In addition, teaching your preschooler good listening skills can help him interact better with others now as he will understand more clearly what others expect of him. Check out preschool sharing activities and math activities for preschoolers too.